The old Muslim Cemetery in Hong Kong was located at 7, Seymore Street, (near the Jewish Synagogue) where only 5 or 6 burials took place before it was resumed. A new cemetery was then provided in Happy Valley where the earliest grave dates back to 1828. A small Mosque was constructed adjoining the cemetery mainly to hold Janazah Prayers. With the increase in Muslim population on Hong Kong Island, Muslims living close by began to use the Mosque for daily prayers as well. A new and larger Mosque was constructed after World War II which remained in use until December 1978 when it was resumed by Government to construct approach roads for the Aberdeen Tunnel. 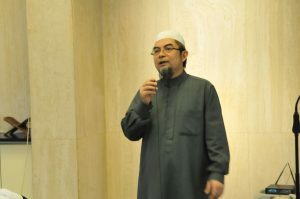 As compensation the Government provided a plot of land located at 40 Oi Kwan Road in Wan Chai, and paid $2.5 million towards the re-provisioning for a new Mosque. The construction work commenced in September 1979 and an eight storey building has been constructed with funds being provided by the Islamic Union of Hong Kong and completed in 1981. The new building ‘Masjid Ammar & Osman Ramju Sadick Islamic Centre’ was formally opened on September 14, 1981. 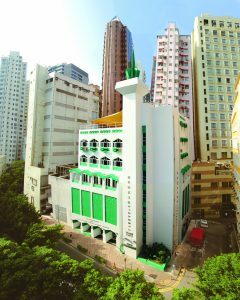 The property is owned by the Incorporated Trustees of the Islamic Community Fund of Hong Kong which has given its management to the Islamic Union of Hong Kong who look after the Masjid & Islamic Centre and cater to the needs of the Muslim Community. It contains a Mosque on the second floor with ablution facilities for men and women on the first floor. Five times prayers are held in the Mosque. A prayer hall for ladies is located on the third floor. Floors four to eight provide administrative and communal facilities including classrooms, Islamic canteen, library, offices for Imams & Qur’an teacher and Islamic organizations, conference and seminar rooms and a medical clinic. Muslim Community Kindergarten is located on the ground floor. The Centre can accommodate more than 1500 people.